Allow player to change NPC\'s gears and let them keep wearing the given gears. You can now choose to lock/unlock controlled NPC's current gears. Once the gears are locked, NPCs will keep wearing these gears even if you give them better ones, or remove the gears from their inventories, or call the setoutfit function using another mod (The usual "change my outfit set" feature provided by many mods). Note that only the gears given after NPC is added to control are in buffer and lockable, and if a body part is not given any gear before locking, this body part can still wear new gears after locking. 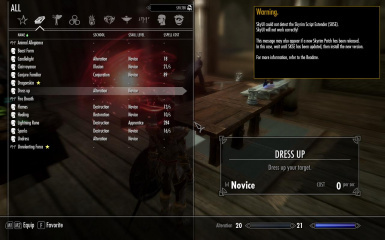 I've decided to remake this mod because I have kept a lot of clothes mods but only my character can permanently wear them. Although this is a complete new mod, I would still recommend you to uninstall the old version before install the new one. 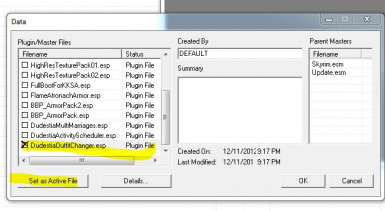 Then use NMM to install it, or unpack and copy everything to Data folder. You will receive a "Ring of Fashion Designer" once enter the game. When you wear the ring, you can press e to activate NPCs and dress them up. Choose "Release" to release the NPC from outfit control. If some NPC keep switching from the clothes you gave and their default outfits, choose "Remove Default" to remove their default outfit settings (be aware that this change is permanent). This mod provides 200 control slots, but is easy to add more slots with simple CK skill. I will provide an instruction later. then type player.additem(0A004312, 1), the ring should add to your inventory now. 6. 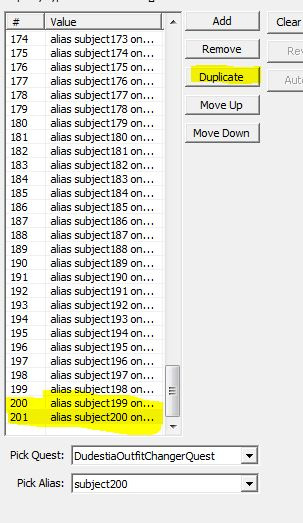 Choose the last element of the array, duplicate it and change its value to the new alias you've just added. 7. save the mod and you now get one more slot. This is actually an "experimental" by-product of my multiple marriages mod, i.e. something I plan to include or improve in that mod but release as individual package here for bug testing. So please be aware of bugs and always backup your game before using it. 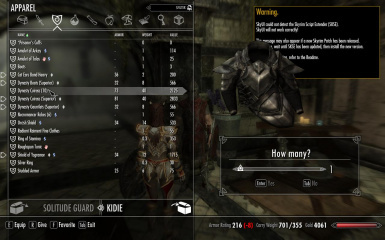 This mod won't maintain follower's clothing because they have higher priority. I've done two implementations with different methods. 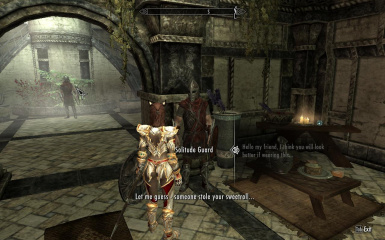 For the first one (NPC Clothes Changer and Maintainer), it provides dialogues for friendly NPC so that you can ask NPC to wear armors that you give them. 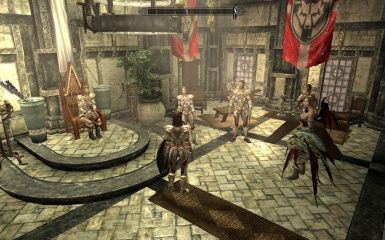 The background outfit maintainer will keep letting the NPC wear those armors unless you remove the NPC from the maintainer via dialogue, or give the NPC another armor. Advantage: NPCs will wear any armor you give them. Limitation: At the moment, the maintainer can maintain outfits of up to 100 NPCs. So if you run out of slot, remove some of them from the maintainer. And armor only (this will be fixed in the future). 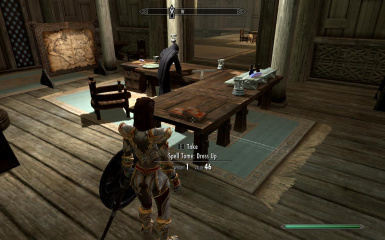 For the second one (NPC Clothes Changer Method 2), two spells are placed at the desk of dragonsreach's mage room, you can case the dress up spell on npc to open their inventory and change clothes, the undress spell will remove the player team mate flag with the npc and open the inventory again for you to pick up the gears. 2. If you draw your weapon, the npc will do the same..
You can use the undress spell to remove the teammate effect. Version 0.9.2 has fixed the weapon given bug and merged two methods together as one mod, so if you do it via dialogue, you are using method 1 (control via maintainer), if you do it via spell, you are using method2 (playerteammate). The spells are still in dragonsreach mage room. 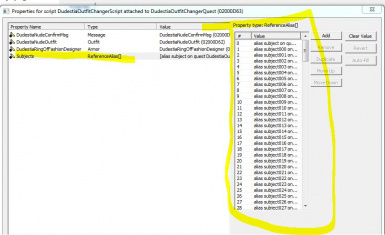 I want to remind you that, as this mod does not actually change NPC's outfit setting, if the game call setoutfit function directly, the npc will still change to their default outfit, but try change the location or sleep for an hour, the npc should put on their new clothes once their 3d models are reloaded. Please leave comments if you find any bug, or endorse me if you find this mod useful. 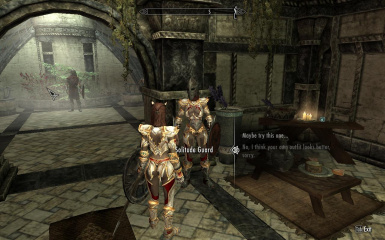 New dialogue options are added to NPC, simply talk to them and give them the armors. To remove NPC from maintainer, choose "no, I think your own outfit looks better..."